Promptly at 1100 the first immaculate former Leicester City Transport vehicle departed well laden from the National Space Centre car park to inaugurate the Leicester Transport History Trust’s heritage bus running day. The event continues to grow in popularity and this year was again linked with an open day at the nearby First depot and activities at the adjacent Leicester Museum’s Abbey Pumping Station site. Patronage of the free services continued at a high level throughout the day, linking with LTHT’s Stoneygate tram depot to the south of the city, the Quorn station of the Great Central Railway or simply touring the local area. 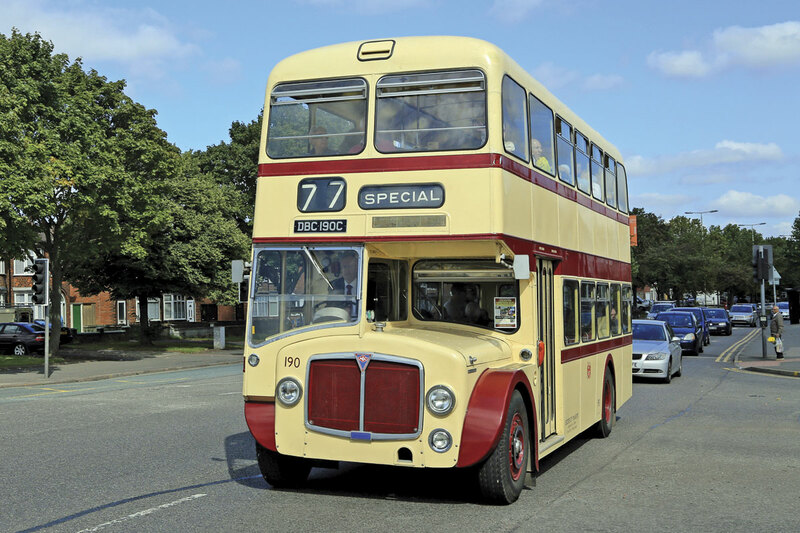 The heritage vehicles in operation represented four generations of Leicester vehicles, from a Leyland PD2 of 1950 through the 30 foot AEC and Leyland double-deckers of the 1960s and a 1970s Metro-Scania to the Dennis Dominators of the 1980s. 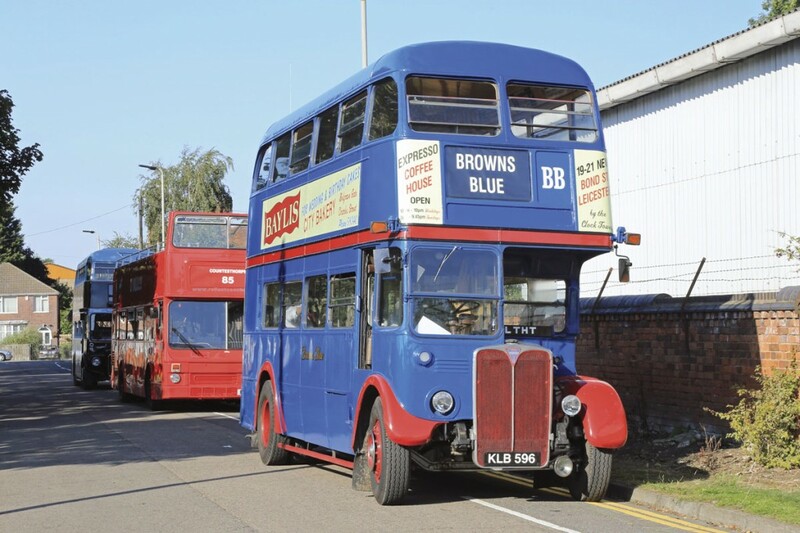 An AEC RT in the livery of former local operator, Browns Blue of Markfield, appeared on a selection of duties all day including a late afternoon tour taking in the Golden Mile of Melton Road and the north east Leicester suburbs. Despite reaching what is normally considered retirement age this year, the bus is still a sprightly performer although its 7foot 6inch width pays homage to the time of its design when the average person size was considerably less than nowadays! Back up to the Leicester vehicles on service was provided by a Confidence liveried Routemaster, a Coventry Daimler Fleetline and a locally based open top Metrobus which operated a popular duplicate to Quorn in the sunshine. A number of visiting vehicles were on display in the Space Centre coach park including a new Mercedes-Benz Atego based Unvi Voyager GT from Woods Coaches and a Wrightbus StreetLite DF from the local Arriva operation. 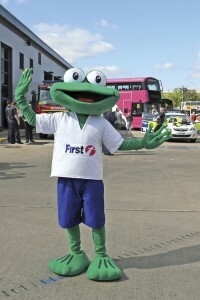 First’s local driver training fleet was also there, one example carrying the latest corporate style training livery that made its role very clear. 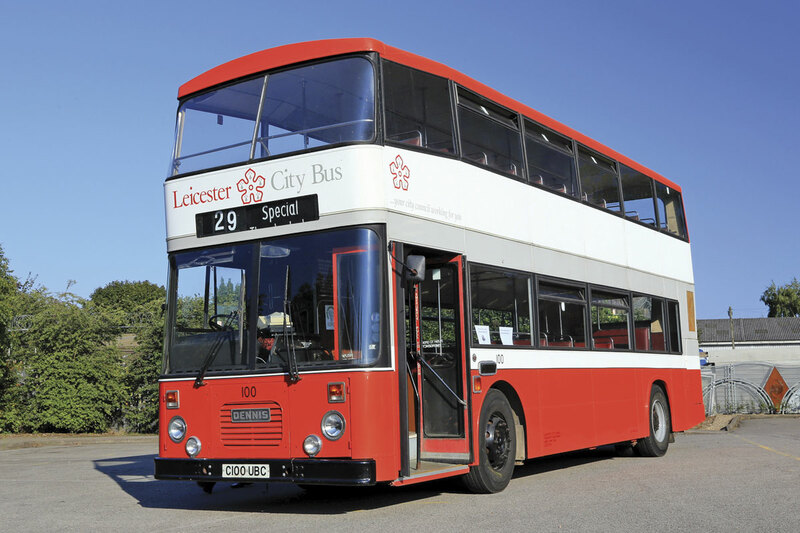 A Leicester City Transport liveried First Leicester Gemini operated a half hourly link to the open day at the nearby First depot. On arrival there, it took visitors for a ride through the bus wash before returning, it was probably washed a dozen times during the day. Such was the popularity of the bus wash ride that one of the depot’s Enviro 400s with 22 route branding was also deployed. 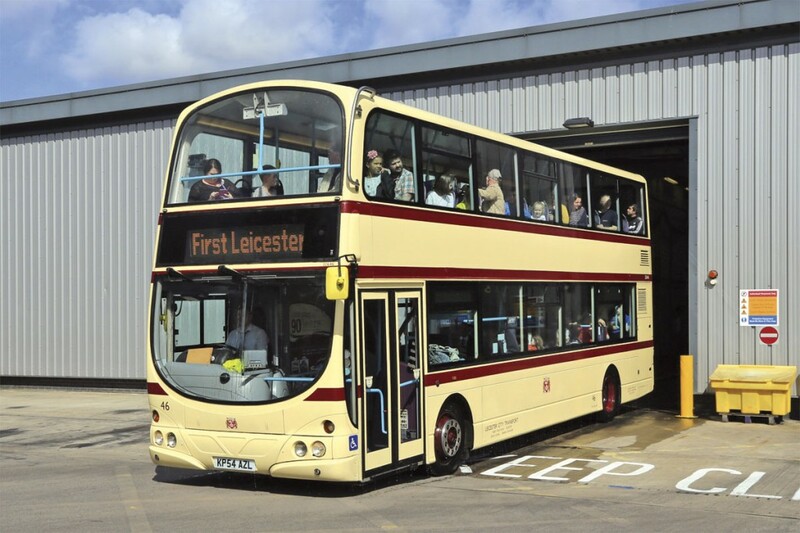 Prominently parked in front of the depot was the first Wrightbus StreetDeck for First’s Leicester operation that had arrived during the previous week. 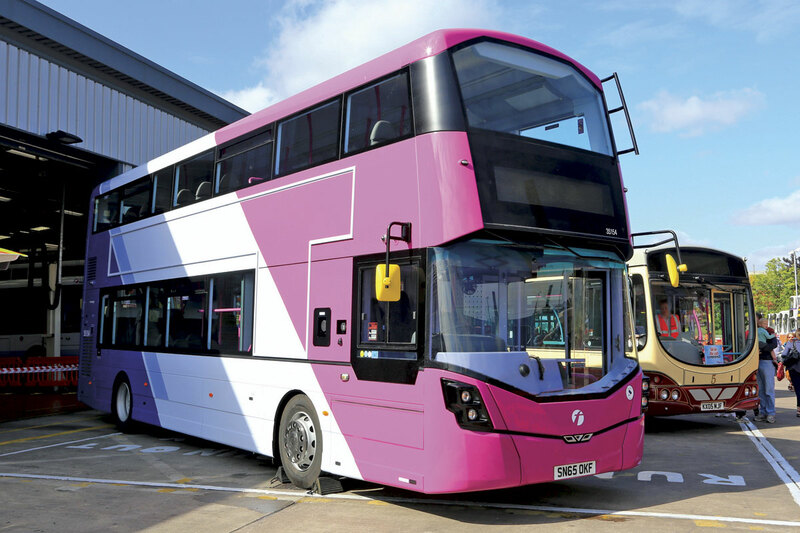 Finished in the latest version of corporate livery, it has the bold raspberry front introduced by First Midlands on a StreetLite for Potteries shown at Euro Bus Expo 2014. The Daimler powered StreetDeck accommodates up to 73 seated passengers on leather trimmed Isri seats including seven tip ups with a total capacity of 100. 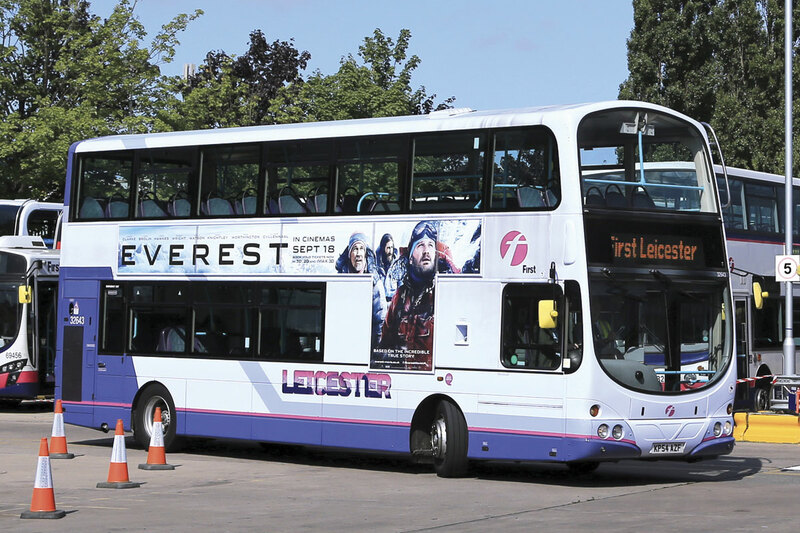 Fresh from leading the first tour of the depot, First Midlands MD Nigel Eggleton advised that it was one of five due imminently for Leicester and would be followed by 13 StreetLites in November and a further 29 StreetDecks from April 2016 to drive a major reduction in the age profile of the city’s 98 strong fleet. 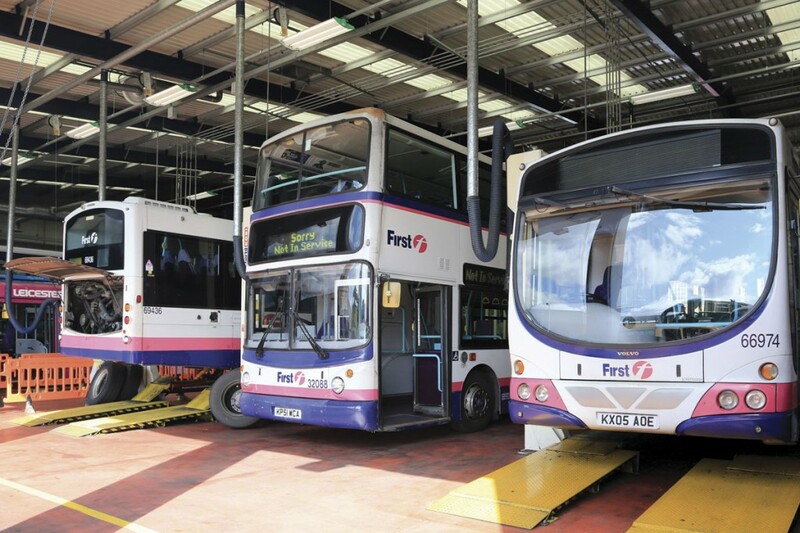 A further four StreetDecks are also due for service 44 in Worcester and ten two year old StreetLites will be shared between Leicester and the Potteries. Nigel later took a turn at the wheel of one of the heritage vehicles, joining fellow First MD James Freeman who was on the road with the rear entrance LCT AEC Bridgemaster. Regular guided tours of the depot were on offer and attracting good numbers of interested visitors. Three specific areas were covered, the control office, the parts management department and the workshop. Most impressive throughout the tour was the level of enthusiasm for the business displayed by all the First staff involved and their commitment to health and safety, both of visitors and in their day to day operations. First has strongly promoted a safety culture across the business and it was obvious that this was now second nature to staff and not an afterthought. In the control office, there was a demonstration of the Greenroad tracking and monitoring system with details of its forthcoming upgrading to real time and an explanation of the measures that the company takes to ensure whenever possible an even headway is maintained on the frequent city routes. Moving to the parts management department, visitors saw the impressive 54 tray Kardex system used mainly for storing Volvo parts and were provided with a range of statistics on the average annual usage and costs of a variety of items. In the workshop area, emphasis was placed on First’s National Maintenance Procedures manual designed to ensure that the safety and reliability of the company’s vehicles was to a consistent high standard across the country. The procedure for refixing wheels with associated follow up torque checks was described in some detail along with the annual test programme where a 100% pass rate has been achieved since April. Volvo B7 based vehicles have been the mainstay of the Leicester operation for over ten years and the maintenance regime in place, including regular oil checks and changes has meant only two engines have required a full rebuilding by outside specialists since their introduction. At the rear of the depot, a driving circuit had been laid out where visitors could take the wheel of a Volvo Gemini double-decker in return for a £20 donation to charity. By avoiding the cones, participants were rewarded with a signed certificate. Heritage vehicles were displayed alongside the depot and the event was supported by a number of charities and enthusiast organisations. 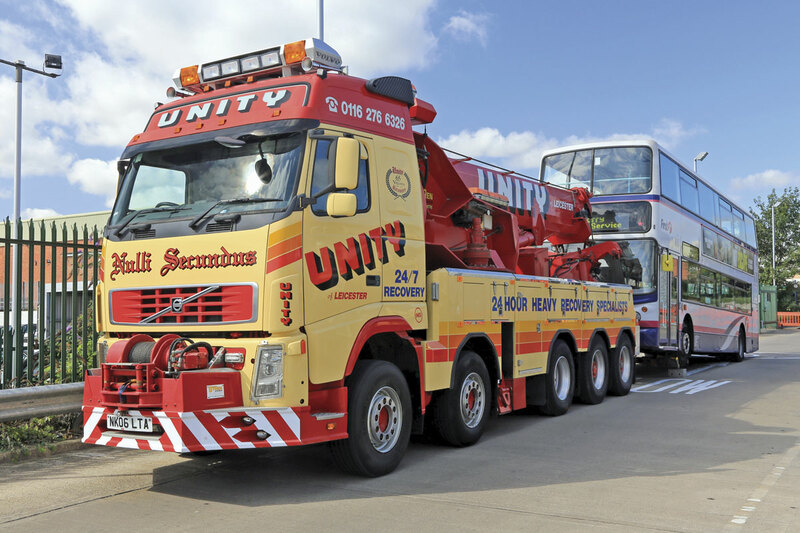 There was also an impressive recovery vehicle from recovery specialists Unity and vehicles from the local emergency services. Sounding the police car’s siren was popular with young visitors, fortunately the site is away from housing! Alongside the Space Centre car park is the Abbey Pumping Station Museum which is well worth a visit. A range of activities were on offer for young and old including an inland beach and steaming of the site’s impressive pumping engines. 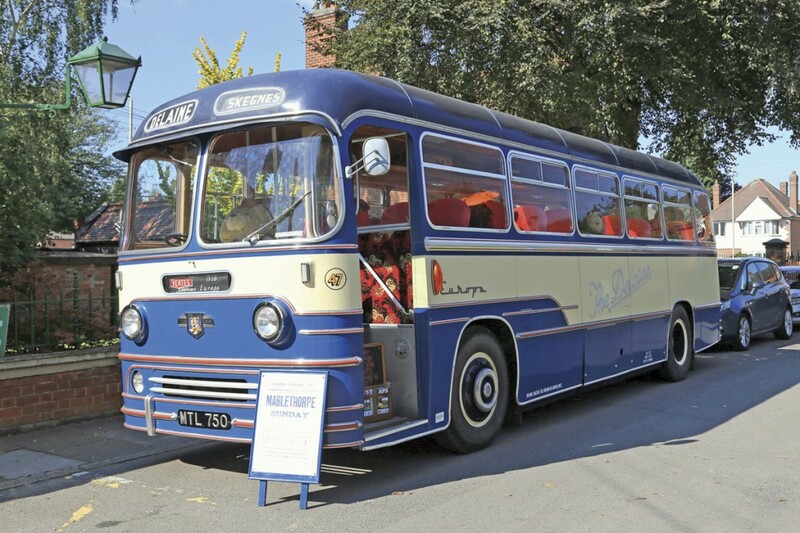 The museum is home to a superbly restored Yeates Europa bodied Leyland Tiger Cub which originated with The Delaine and the 1939 Leicester City Transport AEC Renown together with a range of road vehicles from the horse, steam and petrol eras. Alongside the main building, Wellglade’s Kinch Bus were promoting the Skylink service to East Midlands airport with one of their latest Citaros in dedicated livery. With blue skies and sunshine for much of the day, the linked events attracted significant visitor numbers with something to suit most interests. The heritage buses performed almost faultlessly and many First customers learnt how much effort is put into ensuring that their daily journeys are attractive and reliable. It is even possible that a few additional drivers may be recruited as a result of the driving experience!